"Cobblestone Genealogy: Venturing Off the Paper Trail"
Finding your ancestors in census and vital records lays the cornerstones for building your family history. But what if the trail stops there? No baptisms, no deeds, no probate records, none of the conventional records researchers hope to find. Where do you go? 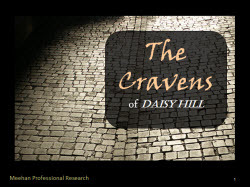 Learn as Lyn traces the Craven family of Daisy Hill, Yorkshire, demonstrating that the process of discovery may not always be linear, or online. In this workshop, we will step off the paper trail and onto the street, looking for signposts we won’t find in books or files. … the process of discovery may not always be linear and found on paper or online. Sometimes family historians must seek landmarks and artifacts as documentation in tracing an elusive family. In this workshop, we step off the paper trail and onto the street, looking for signposts we won’t find in books or files. A wealth of knowledge from an experienced library professional and researcher! Lyn's email, should you have any follow-up questions and an information package filled with new resources for your next research challenge.